The Orifice Carrier is supplied for applications where existing pipe-work has no facility for orifice tappings: when flanges are not of sufficient thickness, flanges are of composite design or pipes are lined preventing pipe taps. Solartron ISA is able to advise the most suitable flow measurement solution for each application, using proven flow metering technology with Differential Pressure measurement covered in ISO 5167-2, ISO TR-15377, AGA3 and ASME MFC-3M. Improved metering uncertainty as the orifice flange ensures the orifice plate and orifice tappings are compliant to ISO 5167-2, ISO TR-15377, AGA3 and ASME MFC-3M. Solartron ISA is able to advise the most suitable flow measurement solution for each application, using proven flow metering technology with Differential Pressure measurement covered in ISO 5167-2, ISO TR-15377, AGA3 and ASME MFC-3M. 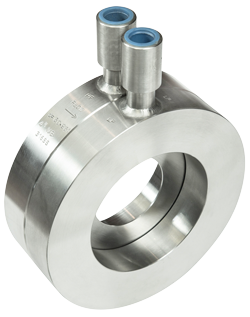 Improved metering uncertainty as the orifice flange ensures the orifice plate and orifice tappings are compliant to ISO 5167-2, ISO TR-15377, AGA3 and ASME MFC-3M. These devices are low maintenance with no moving parts, and considered an economical cost effective flow measurement solution for many gas, liquid and steam applications.